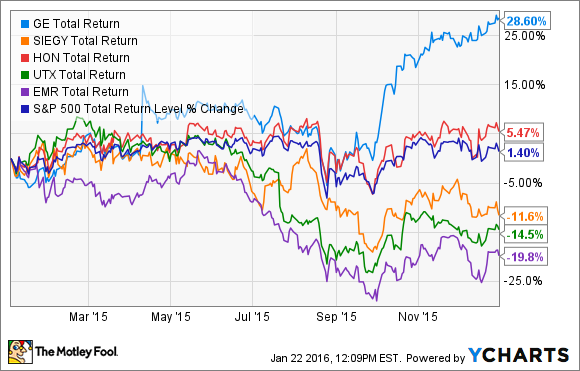 Will Emerson Electric Underperform Its Peers in 2016 -- Again? The industrial stalwart may have the best dividend in the sector, but that wasn't enough to save it last year. Will this year be any different? This year has started off rough for the markets. The S&P is down more than 5% as of this writing. Only Honeywell (NYSE: HON) is beating the market right now, and just by the hairs on its chinny-chin-chin. 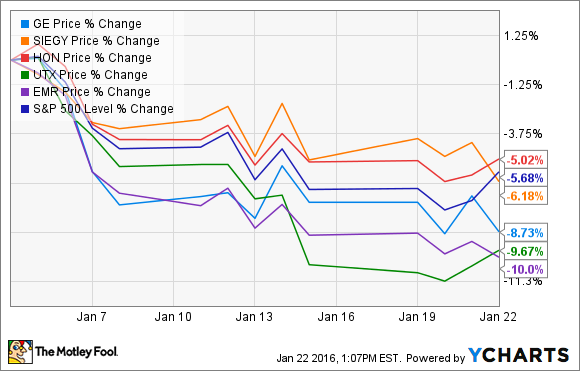 Emerson is the worst performer of the lot, with a double-digit loss so far this year. But you should think twice before buying it on the hopes of a turnaround. Source: Google Finance. Author's chart. 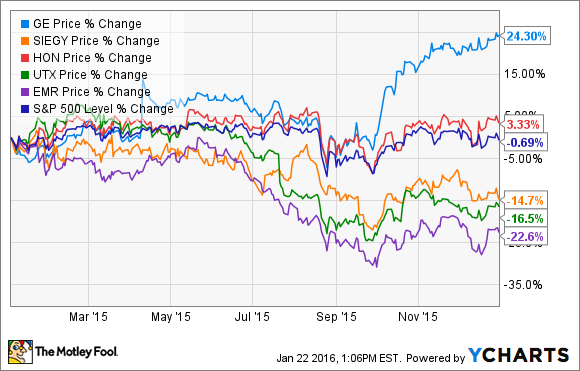 Like many of its peers, Emerson's fortunes are affected by the oil and gas industry. However, Emerson differs in the scope of its oil and gas exposure. Its largest segment by far, Process Management, has heavy oil and gas exposure, servicing oil and gas reservoirs and refineries. Its Industrial Automation segment also has significant oil and gas exposure. It's hardly surprising, then, that these two segments were hit hard in the company's 2015 fiscal year. Process management sales were down 7% YOY, with revenue down 22%. Industrial Automation fared even worse, with sales down 17% and earnings down a whopping 25% YOY. The company specifically blamed oil prices, saying that "persistent low oil and gas prices reduced capital and operating spending, especially in upstream markets." This is an industrywide issue, with companies such as General Electric and Honeywell both seeing declines in divisions with high oil and gas exposure in recent quarters. Unlike GE and Honeywell, however, earnings in all of Emerson's divisions -- even those without significant oil and gas exposure -- declined in FY2015. The segment that fared the worst, for example, was Network Power, which saw its earnings halved. By contrast, GE and Honeywell have divisions whose performances are helping to offset the negative effects of oil and gas prices on the company's overall results. [W]e're ready for, what I would say, the first negative quarter and then the second negative quarter, which I believe underlying sales could be down somewhere in the 5% to 6% range, and then we'll start coming out both from an easy comparison but also seeing some stability in the markets we serve. Yes, our underlying sales were down over 2%. Yes, our reported sales were down 9%. ... The environment is what the environment is. We deal with it, but we're going to try to control what we can control and we're going to control our profitability, our cash flow, our return, and any acquisitions we can get done. In spite of Emerson's stellar dividend -- and it really is stellar -- there's not a lot to be optimistic about for Emerson in the near term. When the best you can look forward to is stabilization of YOY numbers because your prior-year numbers are so dismal, that's pretty weak sauce for investors to stomach. And if things in the oil markets don't turn around, as anticipated? Yikes. The outlooks for GE and Honeywell seem more upbeat, although both are making projections based on optimistic 2016 oil price numbers. GE is reinventing its entire company by divesting large portions of its GE Capital financial business portfolio and selling its storied Appliances unit. Honeywell is coming off six consecutive years of double-digit earnings growth, with predictions that growth will continue. Emerson is coming off an exceptionally weak year with a plan to "try to control what [it] can control." What you should control are your expectations for Emerson in 2016.